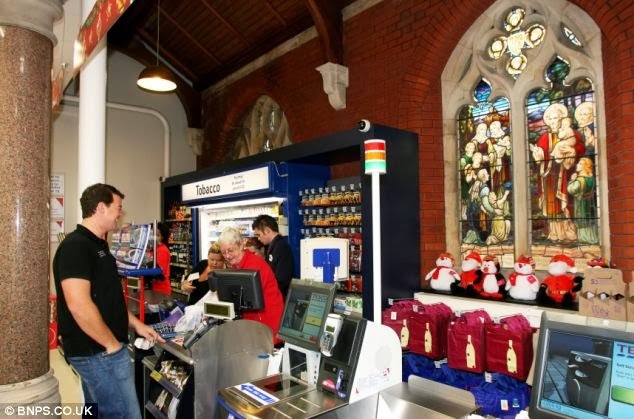 The supermarket is the church of the 21st century. Out of town parks where the faithful congregate to pay homage. Glass cathedrals to consumerism. Perpetually kept below room temperature. In-house radio that offers soporific pop songs and musak to lull the unwitting. Fluorescent lighting rarely noticed at elevation. Smarting if stared directly at. Herded into lines to donate to the collection. A marriage of convenience. A hermetically sealed paradise. And what of the small shopkeeper? The pagan of this new world. The men and women who must wrestle with such abstract concepts as ‘competition’ and ‘market forces’. Stores that once stood as cornerstones to the community. Where gossip was exchanged and bonds formed. Where people knew your name. An intimacy with our neighbours is vital to retain a sense of individuality. What we need is a bit of local flavour. Instead of being referred to as ‘units’. These places, these islands of calm exist yet. However, they are fast becoming an endangered species. The local mini-mart contributes as much to the Food Standards Agency each year as the out of town hyper-market. Yet the latter makes more profit in a few minutes than the former does in days. You can buy fifty different types of breakfast cereal, but the choice of where to make your purchase is slowly being eroded. The main supermarkets operate as a cartel, lobbying en masse, ensuring they get exactly what they want. So the minnows are out priced and out manoeuvred. Local produce is ignored in favour of cheaper imports. And while new developments may boast to create hundreds of new jobs, rarely is it mentioned how many are rendered redundant from lack of custom. Supermarkets are not the only perpetrators of this kind of consumer warfare. Nor are food stores the only ones which suffer. The effect is cumulative. Less people frequenting the local butcher’s or mini-mart, means fewer popping into the second hand bookshop or hardware store. Whereas the high street can survive by offering diversity, it is those whose income rely on residential areas that are most in danger. The illusion of choice is in reality a decline in quality. The advent of fast food chains, means that takeaways which once operated solely as kebab houses are now forced to branch out. Fish and chips, curry, cheese burgers, kebabs, pizza, egg fried rice, the list is endless. All sold under one roof. All meshed together, by a handful of staff, in a matter of minutes. There is something enduring about entering a place which retains its own unique character. A shop that is instantly accessible. Tactile. Infused with a plethora of aromas. Fresh fruit and hair products and incense. Scents which can set in motion a dozen memories with but a whiff. It is hard to imagine anyone ever waxing lyrical over their gargantuan counterparts. Soulless as government buildings. Re-circulated air stirring all odours up into nothingness. Dulling the senses. Of course change is inevitable. However, it is not always for the greater good. What we need is to retain a sense of identity. When an avenue for communication is arrested, we become smaller. More isolated. Man is a social creature. The men and women before you are not merely the purveyors of goods. They are keystones to a quality as old as the human race itself: Community. If they are allowed to be engulfed, then a part of us will be consumed too.